Make your own fruit and veggie wash! Keep those greens clean, mama! 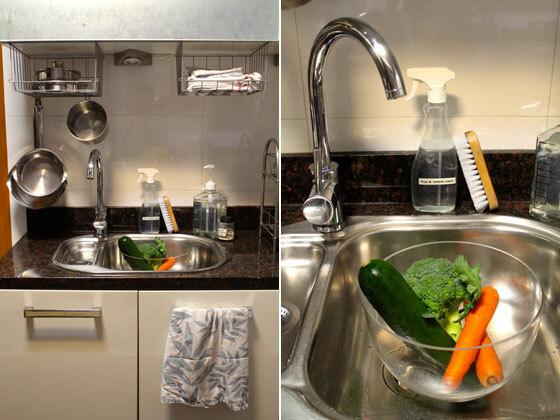 Do you always give your fruit and veg a good wash before biting in? I’ll be honest, not always. Sometimes, when I’m really feeling a bit… lazy, I’ll do a quick splash under the tap, but if there were any pesticides or bacteria there that could do damage I wouldn’t have made a dent in it. No more excuses! I now have the best, easiest, no-fuss recipe for a Fruit & Veggie Wash – that puts the clean in clean eating! Recently, I became a volunteer community farmer, and getting close to your food makes you think about where it all comes from. The fact is that before your potatoes or apples reach you, your produce has been handled by several pairs of hands from the field, through the warehouse and to the grocery store. In commercial farming, they are sprayed with chemicals and pesticides – and bacteria can be introduced at any point, from the fertilizer used, to poor hygiene practices by the handlers or even on your own kitchen counter. Basically, that wholesome apple that you are about to bite into can pack a lot more than just vitamins! Doctors are most concerned with bacteria and pathogens, like e. coli and salmonella, as well as other common strains of bacteria that can multiply rapidly in our gut. Though pesticides are deemed safe for human consumption, the cumulative effect of consuming different types of pesticides, over a long period is a concern. Some types of pesticides have been linked to cancer and may affect the hormone or endocrine system. In frogs, it changes males to females. In children, it can cause early puberty or fertility issues. They’re not making it easy for us, are they! I’ve been looking into the matter and found some really interesting studies where researches tested the effectiveness of washing, using four different methods, for removing bacteria and chemicals. They tested plain water, scrubbing with water, soap and vinegar. The study showed that while soap did work, most agree that adding detergents to your food is not a good idea. Water with scrubbing was effective at removing some pesticide residue and bacteria but, the most effective was a vinegar rinsewith scrubbing, removing up to 75% of pesticides and 98% of bacteria! Is there anything vinegar can’t do? Spray the produce with Fruit & Veggie Wash. Let it sit for at least 10 minutes, then scrub the skin and rinse with water. Fill a bowl with your produce and cover with Fruit & Veggie Wash. Let it soak for at least 10 minutes then rinse in a colander shaking and agitating it much as you can.